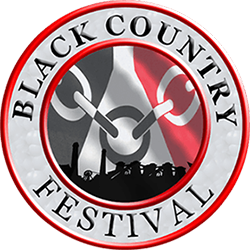 The Black Country Festival is a series of independently organised events throughout July encompassing the Official Black Country Day which is on July 14th every year. Each event is designed to bring the Black Country communities & people together using the celebration of our shared Black Country culture and heritage. Anyone can put on an event, just get in touch to add your event here, or ask us any questions. Click on the headings below to discover more about Black Country day, some history, or even ... Where the heck is the Black Country?! It has always been said that the easiest way to start a fight in a Black Country pub is to ask for a definition of the term. One takes it as the area encompassed by the famous ‘30-foot’ coal seam; another that it is a wider region, stretching from Wolverhampton to the border of Smethwick; another that it is the four boroughs of Wolverhampton, Walsall, Sandwell and Dudley. Perhaps for this reason, the Ordnance Survey have been reluctant to spell it out on a map. 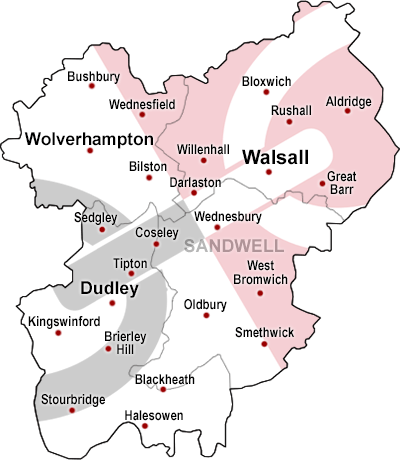 The Black Country has no defined borders but to traditionalists is defined as "the area where the coal seam comes to the surface – so Brierley Hill, West Bromwich, Oldbury, Blackheath, Cradley Heath, Old Hill, Bilston, Dudley, Netherton, Tipton, and parts of Wednesbury, Halesowen, Walsall, Wolverhampton and Stourbridge but not Smethwick and most definitely not Birmingham. Today it commonly refers to the majority of the four boroughs of Dudley, Sandwell, Walsall and Wolverhampton although it is said that "no two Black Country men or women will agree on where it starts or ends". The Black Country is anywhere within an hours weary trudge of Dudley Castle! Why Is It Called The Black Country? From its industrial heritage, the general appearance of the area, to the shallow seams of coal that also made the earth (soil) black. There are several reasons explaining how the area got its name. It's said that the Black Country gained its name in the mid-nineteenth century from the smoke from the many thousands of ironworking foundries and forges. Other theories mention the abundance of coal in the region - the working of the shallow and 30ft thick seams. The phrase developed in the early 19th century to define and describe that area of intense coal and iron production in the West Midlands. The first recorded use of the term "the Black Country" may be from a toast given by a Mr Simpson, town clerk to Lichfield, addressing a Reformer's meeting on 24 November 1841, published in the Staffordshire Advertiser. He describes going into the "black country" of Staffordshire - Wolverhampton, Bilston and Tipton. It was however the American Elihu Burritt who brought the term "the Black Country" into widespread use, when he published his third travel book 'Walks in the Black Country'. The red being a reference to the sheer number of furnaces that could be seen glowing in the darkness, and also the inspiration for the Black Country flag. July 14th was chosen to mark the region’s industrial heritage. July 14th is the anniversary of the invention of the World’s first steam engine, the Newcomen Engine, built in the Black Country in 1712. 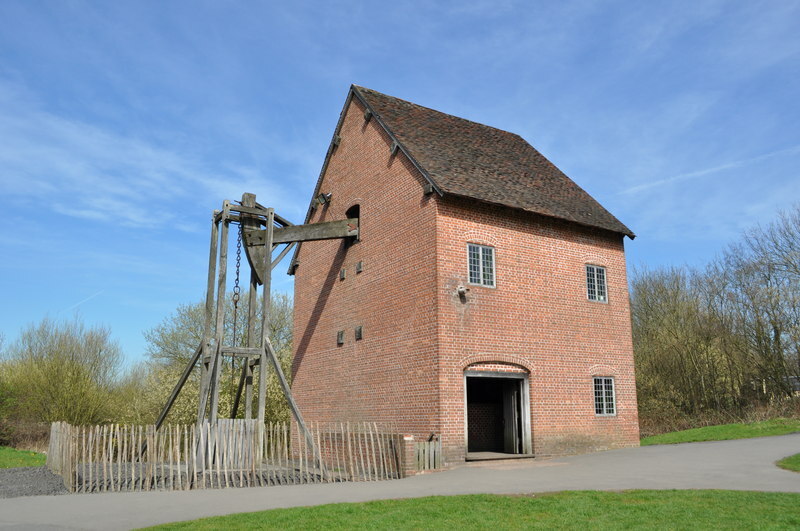 A replica of the engine can be seen at the Black Country Living Museum . Our Mission: To get the whole of the world celebrating Black Country Day! The main goal of Black Country Day is to create a sense of community in the Black Country neighborhoods where people live and work. We hope that an increased sense of community will lead to more personal involvement and more cultural, educational and social activities. This in turn, will create a better sense of community and a better place for us all to live. That, plus it's fun! Are you interested in organising an event in your community? Contact us to see how we can help you begin the process. Black Country Day is supported by The Four Black Country Councils: Dudley, Wolverhampton, Sandwell and Walsall.